I have taken the following right from SlowFoodUSA.org. Would love if you could all take the time to read, and then sign their petition to help get to the bottom of what is killing our honey bees. Bees are the key in sustainability. We lose them and…well, I would rather not go there right now. Spring’s going to be a lot quieter this year. 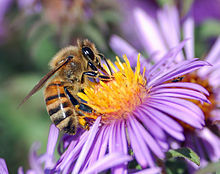 Something is killing off almost 40% of North American honeybees each year, and it’s threatening our entire food chain. Mounting scientific evidence suggests agricultural pesticides are one of the culprits. The Environmental Protection Agency has the power to investigate and ban the pesticides thought to be responsible but, despite their own scientists’ advice and under pressure from pesticides companies, they’re dragging their feet. Bees don’t just make honey: from apples to lemons, much of the food we eat may disappear with the bees. Even milk and beef production could be threatened: guess what makes the plants that feed the cows? Our friend the honeybee. What’s more, bees add $15 billion to the annual US economy, and their loss will have a devastating impact on food production and food prices. But the EPA is under pressure to do nothing about it from pesticide companies and the pesticide ‘scientists’ those companies bankroll. Everyone stands to lose with the threat to our food chain known as CCD. That’s why everyone needs to stand together to counter the pressure the EPA is under not to do it’s job: protect the things we rely on to survive. Many Slow Food chapters are also hosting screenings of a new CCD documentary, Vanishing of the Bees. It’s a great way to get together in your community and learn more about what you can do to help solve this problem. Time and again Slow Food members get together to celebrate the importance of food. It’s now the time to take action to protect that which binds us together, and stand up for the bees that make it all possible. PS – Can you help spread the buzz? For every 100 signatures we collect on our petition to protect the bees we depend on for our food, we’ll send a bee-shaped postcard to the Director of the EPA’s Pesticide Programs. Imagine those on the wall the next time the pesticide lobby pops in! This entry was posted in To Market with Mo and tagged bees, Chicago Farmer's Markets, Evanston Farmer's Market, Glenwood Sunday Market, Heritage Prairie Farms, moira's blog, SlowFoodUSA.org, sustainability, sustainable, to market with mo. Bookmark the permalink.